The House made quick work last week passing a measure that would lift a veil of secrecy on how individual lawmakers allocate capital infrastructure money under their control. Currently, New Mexico is the only state in the nation that allows legislators to divvy up among themselves a big chunk of infrastructure money to direct to projects as they see fit. And it allows them to keep secret which projects they choose to fund, although the information is readily available in an existing database. Sen. Sander Rue discusses capital outlay transparency with the Senate Rules committee in 2018, during which rural legislators explained their reservations about the measure. Sen. Daniel Ivey-Soto, D-Albuquerque, called it the “super-secret private list which is the one that actually appropriates the money” last year during a Senate Rules Committee debate on the issue. Two legislators, Sen. Sander Rue, R-Albuquerque, and Rep. Matthew McQueen, D-Santa Fe, have been trying for years to pass a law requiring the list be made public. Each has introduced very similar bills this year, requiring the “super-secret” list to be posted on the legislative website after the governor has signed or vetoed bills after a session. The rationale for posting it after a session, McQueen said at a committee hearing last week, was so the governor wouldn’t know who had sponsored what appropriation when making veto decisions. It’s a real concern among lawmakers. A governor might hold the threat of vetoing capital outlay money over their heads in order to compel them to vote a particular way. In 2016, New Mexico In Depth reported that two-thirds of capital outlay projects vetoed by Gov. Susana Martinez were of projects sponsored solely by Democrats. Her predecessor, Democratic Gov. Bill Richardson, in some years was known to veto more Republican capital outlay projects than Democratic ones. 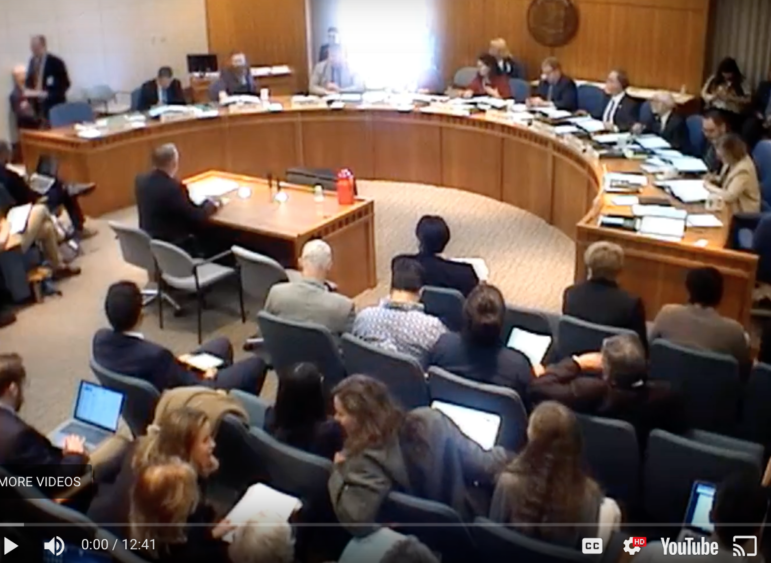 While the House of Representatives has appeared more receptive to public scrutiny of how lawmakers fund local projects – that chamber passed McQueen’s bill in 2017 and HB 262 last week – the real test is in the Senate. Both Rue and McQueen have been stymied by the Senate Rules committee. The main argument against the transparency measure, by mostly rural lawmakers, is that constituents won’t understand why a particular lawmaker’s name might not show up as having funded a local project, while not understanding they may have worked with neighboring legislators to collectively allocate funds for their region. Rue responded that he understood that rural and urban lawmakers face different pressures, but that they should be willing and able to explain their choices to constituents. This year McQueen and Rue are joined by other sponsors, all Democrats from Albuquerque–Reps. Natalie Figueroa and Joy Garratt, and Sen. Jacob Candelaria. Sen. Linda Lopez, D-ABQ, said yesterday as the Rules committee was wrapping up that the committee would take up the capital outlay transparency issue Friday morning. This debate over transparency rests within a larger debate about allowing lawmakers to divvy up and assign individually capital outlay dollars, with reformers arguing it’s inefficient. Scarce resources are spent on projects that haven’t been planned properly while more worthy projects go unfunded, they said. As the Legislative Finance Committee noted in its 2019 budget proposal (p. 61) to the Legislature, a “vast amount of unexpended appropriations and large number of projects” remain inactive. Poor project selection (including insufficient planning, a piecemeal approach to funding, and unknown construction costs) continues to delay project completion. The LFC included “increasing transparency by identifying which legislators sponsor each project included in capital outlay legislation” among reform proposals. The Senate Rules Committee killed a bill today to make public the capital outlay funding decisions of individual legislators. Currently, New Mexico’s capital outlay system allows lawmakers to divvy up a pot of money among themselves to then give out to projects as they see fit, and to keep that information secret.